Home Documentation Persuasion Tactics: What kind of Persuasion Tactics does Convertize offer? Persuasion Tactics: What kind of Persuasion Tactics does Convertize offer? Can my entire team work on Convertize? How do I upgrade my plan? Can I track light boxes (pop-up windows) on my website? Why is the font of my website different on Convertize Editor? How do you identify returning users? What are the plugins slowing down my WordPress site? What goal should I track? What is the pixel code doing to my website? What type of Page View goal should I set up? Which URL targeting should I use for my experiment ? Where do I insert the Convertize pixel in my source code? What type of payment do you accept? Can I change or modify an experiment while it is running? Can I delete an experiment ? How can I access my tactics? How does the Scarcity SmartPlugin™ work? How does the Urgency SmartPlugin™ work? How do I just test my homepage with extra parameters? Why do I have to wait for a reliable result? What is the Duration Simulator? What is the visitor counting rule? What is the minimum number of visitors I need to get reliable results? Where can I find the pixel code? 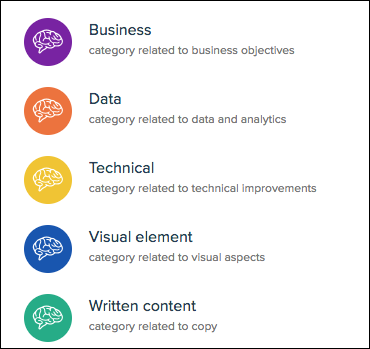 Convertize provides structured guidelines for website adjustments based on neuromarketing principles. This advice is divided into 250+ Persuasion Tactics, which give ready-made hypotheses based on the pages you need to optimise. The “Starter” plan has 100 tactics available, whereas the “Team” and “Enterprise” plans both offer 250 persuasion tactics. Each time Convertize releases a new series of tactics, all of them will be allocated to the “Team” and “Enterprise” plans. In addition to the paid plans the “Free” plan offers 30 tactics. Read this article to learn more about how to access the tactics available for your plan.